Description: The editors of “Many Bloody Returns” deliver the perfect howl-iday gift, with new tales from Patricia Briggs, Carrie Vaughn, and many more. Whether wolfing down a holiday feast (use your imagination) or craving some hair of the dog on New Year’s morning, the werewolves in these frighteningly original stories will surprise, delight, amuse, and scare the pants off readers who love a little wolfsbane with their mistletoe. Review: Everything about the way I approached Wolfsbane and Mistletoe was outside of my norm for anthologies. It is rare for me to read one cover to cover. Typically I will read a story here and there as it relates to a series that I am currently reading. In fact, I am sure my librarian thinks I am a bit of lunatic based on the number of times I have checked out, checked back in, and a couple months later checked out certain anthologies. (I follow a LOT of urban fantasy series, which seem to thrive on the between-book short stories published in anthologies). I think what made the difference this time was that this particular anthology came available on audio book through the library. It got me thinking that it might be fun to just go ahead and listen to the entire volume, rather than just trying to hit a couple relevant stories. So began my journey through W&M. As you would expect, some of the stories were better than others. Of course I enjoyed the familiarity of some of my favorite characters as they appeared in some of the shorts. I was delighted and surprised, however, to find my enjoyment in a couple of the tales for which I no experience with their authors. There were a couple of clunkers that I decided to fast forward through to the next story, but only two. 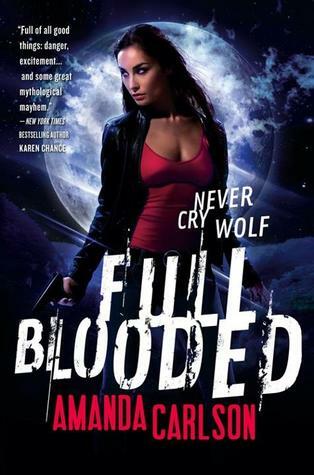 On the whole, the collection was a lot of fun, especially for fans for Urban Fantasy. Description: First, she has no soul. Second, she’s a spinster whose father is both Italian and dead. Third, she was rudely attacked by a vampire, breaking all standards of social etiquette. 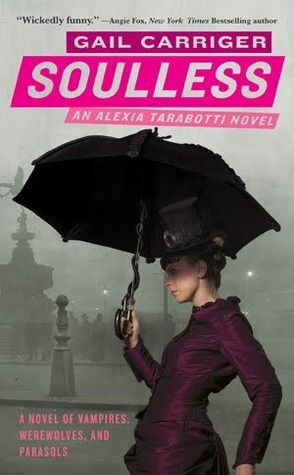 Review: Take one part paranormal fantasy and mix it with equal parts historical mystery, add a bit of streampunk and large dollop of comedy, then top off with a dash of romance and you get the novel Soulless. The recipe may be unconventional, but the result is quite delicious. Alexia Tarabotti is a strong and independent woman who has no problem voicing her opinions. This is precisely why, Victorian England, she and everyone she knows accepts her fate as a spinster. If they all knew that she was truly a preternatural being without a soul, somewhat the antidote to supernatural beings, it would be quite the scandal. Being so strong willed, and well, nosy, Alexia can’t help find herself stumbling into trouble and into the way of alpha Werewolf, Lord Maccon (think handsome Scottish bull in a china shop), who is head of the agency that monitors supernaturals. They both find themselves caught up in a comical tale of danger and mystery. I really enjoyed the unique combination of styles woven together by Carringer. For some reason, my internal reading voice adopted a prim, yet forceful, tone to narrate the story in my head. I love that Alexia is so concerned with propriety, but then again, not really. Oh, and kudos to Carringer for giving us a complete book, even though it will be a series. I am so tired of ending a book, only to discover that it is not really an end. This was a fun read and I am looking forward to the next book in the series. Cover note: I simply love this cover. 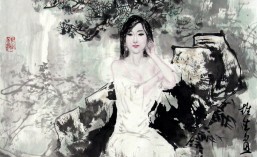 The depicted posture captures Alexia’s prim, but forceful personality. It is well balanced and has great use of color, contrasting the burgundy and pink tones with the blacks and greys. Description: Mercy Thompson returns in the seventh novel in the #1 New York Times bestselling series. 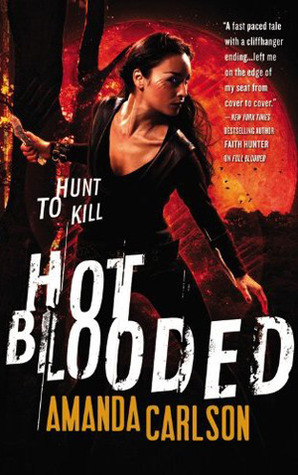 Review: From the moment I discovered Mercy Thompson, I was hooked on the series. While part of me could not wait for the release of Frost Burned, part of me was unsure what to expect. I just did not enjoy the previous book, River Marked, as much as the rest of the series. It did not have the same level of action and suspense that I have loved in the series. Had one of my favorite series gone pale? Now that Mercy and Adam were together, would the lack of unfulfilled tension make the relationship stale? 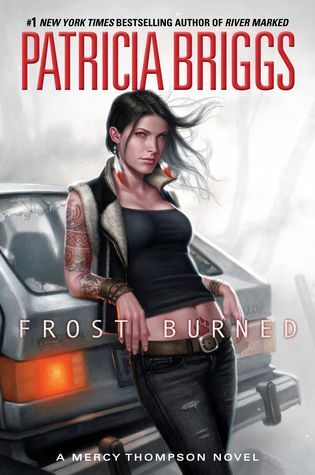 To start, I really like the cover for Frost Burned. I’ve not really been a fan of the previous covers in the series. They always felt more mannish than tomboy to me. The current cover is more how I imagine Mercy and the artwork is fantastic. Good news! My fears were all for naught. Frost Burned turned out to be one of the best books in the series, to date. It helps that I’ve read the entire series, so I know these characters; where they’ve been, how they arrived at this point. The best part is that armed with this knowledge, I can totally appreciate how the characters continue to evolve. The action kicked off rather quickly, and the story kept me on an emotional see-saw for the remainder of the book. (FYI – this is a good thing!) From a world-building perspective, Briggs has now established a political landscape that will easily accommodate a high level of adventure going forward. This really gets me excited about the future of the series. The relationship between Mercy and Adam has matured and changed, in a good way. There is a different type of tension, as they explore and discover their new relationship and the pack bonds. I really have to give Ms. Briggs props for keeping the romance hot, but not overpowering the action. This was a great read. Now, how much longer do I have until book 8, Night Broken comes out?? ?